Thank you to Kennard's Hire, Beau Inkpen, Dayn Jackson, Sascha Colley and Catherine Dillon, Ainslie School's junior playground now has dozens of teddies living in the beautiful trees. Ava and her Year 6 peers, recently enjoyed a Bento Box lunch organised by teacher our teacher of Sensei Cummins. Our Year 5 and 6 students performed at the Inner North Spectacular last week to a full house once again receiving raving reviews from Ainslie School parents, members of our ACT community and staff of the ACT Education Directorate. The Year 6 Band members joined with North Ainslie Primary School’s Year 6 Band to open the Spectacular with complex and well played pieces as a full concert band. Later in the evening, our dance story about ‘Stasia Dabrowski’ hit the stage. The children have worked closely with Jessie Copeman and Catherine Dillon to bring this story to life again following our ‘Step Into The Limelight’ performance, and this was achieved with the children’s ideas of including more complex hip hop choreography and live choral vocals with tealight candles to the story’s powerful conclusion. The Arts curriculum teaches habits, behaviours and attitudes that are valued by communities. Rock on Ainslie School! To acknowledge Ainslie School's 90th birthday, we have installed two extra large Art Deco planting urns and plinths for the front gardens. The pansies and daisies are now in full bloom thanks to a lovely soaking of spring rain. On Tuesday 13 September Ainslie School officially turned 90 years old. This day was celebrated with a birthday party and games for the children and an official assembly that commenced with a Welcome to Country led by Chaydin Reid. There were many official visitors to the school on this day as well as Alma Mater from across Australia. Our Year 5&6 Big Band and Year 1&2 Prep Choir recently performed on the stage at Floriade 2017 in Commonwealth Park. On Tuesday morning, 40 of our year 5 and 6 children attended their technical rehearsal for Step Into The Limelight. The children, along with teachers Catherine Dillon and Jess Copeman, created a dance story about Stasia Dabrowski's significant contribution to Canberra over the last 38 years. The children were inspired with Stasia cooking and hosting a mobile soup kitchen in Garema Place every Friday for the homeless. The theme for Limelight 2017 is 'Inspire'...this theme has certainly inspired our Ainslie School community to tell a significant Canberran story. Zoe from year 4 returned from Tasmania on Monday following her attendance at the National Cross Country Championships. We are so proud of Zoe's running achievements including being 19th in Australia! Thank you as well to her father, Craig Honeybrook, who led cross country training clinics for 16 weeks in the morning before school for all our students. We have 63 children at Year 4 camp enjoying blue skies and crisp mornings at Birrigai. The children are enjoying the flying fox and giant swing. Smiles and fun all round! Milly, Mia, Lucinda and Sofia were definitely ready to go! Oishii Canteen - Smiling Volunteers! Oishii canteen is run by our wonderful managers and requires volunteers to assist every day. We have noticed a reduction in volunteer numbers (and we know how time poor modern families are!) in 2017, so if you have ever considered coming in then please, now is the time! Pictured in the background is Diane Bugg (Diane's Granddaughter, Olivia, is in Year 1) who is a regular volunteer in the canteen. In the foreground is Mikey from Year 2 and his Grandmother'GrandDawn'who was visiting from Perth. Ainslie School students have an opportunity to participate in a variety of clubs every week. The Canberra Potters' Society provides lessons on Tuesdays and Thursdays with children making a variety of beautiful and creative works of art! Ainslie School's Oral History Project, led by Libby Bailey and Vicky Harrington with the assistance of Kimmo Vennonen and Mary Hutchison, is continuing to provide children with opportunities to learn about our school from the Ainslie Alma Mater! Ainslie School students have been participating in a sporting tournament during lunchtimes as part of our 90th Birthday celebrations. Pictured here is Elise from year 5 who is challenging a goal keeper. As part of our strategic commitment to teach and provide more opportunities for students in STE(A)M education, Ainslie School has purchased 1:1 Chromebooks for children in years 4-6 and a further 60 Chromebooks for children in years 3 and year 2. Children in preschool, Kindergarten and year 1 have access to classroom sets of Ipads. In addition we have facilitated the teaching of discrete coding classes and are hosting a weekly coding club. Kindergarten children in this photo are enjoying the Bee-bot robots and older classes also have access to Wedos. We also have a class set of notebooks and Ipads. As part of the school's 90th Birthday festivities, student interviewers have worked with ANU oral historian Mary Hutchison and sound designer, Kimmo Vennonen to conduct oral history interviews following the 2016 Speech Day awards and recent2017 Canberra and Region Heritage Festivalwhen our heritage-listed school building was open for the day led by Libby Bailey. Four of the oral histories have now been published and can be accessed on our 'History' drop down menu on this website. Current Ainslie students are conducting oral history interviews and collecting memories from former students and teachers. We would be delighted if you would like to participate in our Oral History Project! If you would like to be interviewed or have suggestions for interviewees please let us know. 1. Written memories. These can be short snippets or longer stories. 2. Oral history interviews. Student interviewers will work with ANU oral historian Mary Hutchison and sound designer, Kimmo Vennonen to conduct oral history interviews during the 2017 Canberra and Region Heritage Festival when our heritage-listed Donaldson Street school building will be open for the day on Saturday 29 April 2017 from 10am to 4pm. Hosted by former parent and ABC sports commentator, Tim Gaval, who will be asking 90 trivia questions to celebrate Ainslie School's 90th birthday. Don't forget to bring your cash as there will be a silent auction, $20 lucky dip and if you are really (un)lucky fines for bad behaviour! Chris and Jamie from Year 4, recently swam fast times at the Ainslie School Swimming Carnival with Rupert-Smith House taking out the honours. Ainslie Kids do it again! As accomplished musicians and members of the Ainslie School Year 5 Band, (L-R) Adam, George, Fred, Josh, Nathan, Ella and Miah, all auditioned for the Year 6 Instrumental Music Program's Primary Concert Band during Term 4 of 2016 and have been invited to join this representative band during 2017! Well done to our developing maestros! What an achievement! Despite the abnormally warm temperatures in Canberra, the first week of Kindergarten has ended with happy children (and teachers) who all said they would come back for week 2 (phew!). Pictured here are teachers Laurence Mandapat, Catherine Manners and Steve Clarke, on the first day of school organising balloons to celebrate the beginning of the school year. One our youngest members of the school community, Perry, enjoyed eating his healthy lunch with Clair, one of the Oishii Canteen's managers. welcome to the 2017 school year! Teachers and staff of Ainslie School have been organising and preparing for the students to return following their summer holiday. Tomorrow we welcome Kindergarten and preschoolers, with years 1 - 6 primary students returning on Tuesday and another two classes of preschoolers starting on Thursday. Oh happy days! Ailsa's last day ... 18 years at Ainslie School! Ainslie School's P&C Association kindly provided morning tea for the staff at school today! Thank you to Julie Mayhew, Catherine Dillon and Cassie Gillis who prepared the children for amazing performances at the Northside Spectacular at Lyneham Performing Arts Centre this week. Instrumental music, vocal work and dancing was layered as part of the ten minute performance, providing a sophisticated visual and musical feast for the audience. The soloist work was spectacular! Ainslie School's award winning canteen, operates five days a week serving delicious home made meals and snacks . Healthy meals for teachers and parents can also be purchased for $6.50...now that is oishii!!! Ainslie School was very lucky to host the entire 'Welcome Home Olympic Team Entourage' on Monday 5 September! Pictured here are just a few of the athletes: Alyssa Bull (Sprint Kayak), Bronte Campbell (Swimming) and Chloe Esposito (Modern Pentathlon) very proudly displaying her gold medal. Ainslie School students enjoyed being part of 'Step Into The Limelight's' Massed Choir for a gala performance. Ainslie School is proud that teacher and musician, Julie Mayhew, conducted the choir. Thank you to Libby Bailey who spent time researching and writing an application for a 2016 Heritage Grant. Ainslie School has been awarded with over $9000.00 to record oral histories for the school's 90th Birthday. Pictured here are Harper, Isaac, Taj, Beth, Tom and Libby with Minister Gentleman MLA at the announcement ceremony last week in Ainslie School's Goodwin Heritage Library. Mr Gentleman is a member of Ainslie School's Alma Mater. Louis, Ned and Angus from Year 2 competed in last week's athletics carnival. Photo courtesy of Paul Jurak. Our winter walk to school is on again this week. We are meeting at Corroboree Park at 8.20am on Thursday morning and starting our walk to school at 8.30am. We will also be hosting Education Minister Shane Rattenbury MLA, who will walk with members of our school community to Ainslie School's primary campus in Donaldson Street. Mia from Year 3 also enjoyed the snow on Mount Ainslie this morning. This doesn't happen very often and the Ainslie community are certainly enjoying it! It's Raining, It's Pouring...It's Snowing! Ainslie kids woke up this morning to an Antarctic blast of snow. With a maximum of 5 degrees today, and a temperature of 1.1 degrees this morning (that felt like -5.5), Sebastian from Year 2 was warmly dressed for a play in the snow on Mount Ainslie. Join the fun and help fundraise for our school on Election Day. We need bakers, sellers, sizzlers and packers to make it a success. Baked items can be dropped off on the day or to the canteen the Friday before. Label with ingredients list and no cream please. Year 3S have been analysing some of the work of great artists ... here are their Pablo Picasso faces using a crayon and watercolour resist. Ainslie Kids meet Australia's fastest female sprinter! As an active participant in the 'Fresh Tastes' program, Ainslie School's community is committed to promoting good food provision in our school to lead to healthier children with improved concentration and learning attainment. Our children at Ainslie, understand where food comes from and how to cook tasty healthy food. One of our 'Fresh Tastes' activities during term 2 is to embed a culture of healthy food and drinks at school through promoting and sharing healthy lunchbox ideas! Pictured here is Halcyon from Ainslie School's Reid Preschool with her healthy lunchbox! Jaydn from Year 3 has been enjoying experimenting with watercolour techniques. Brush strokes, watercolour wash, disc or tube paints, adding gradients, diffusing colours, layering colours and accents, magic water! Once Jaydn began to master some of these techniques, he was surprised by the wonderful pieces of art that began to come together with just a few simple skills. Here is his very own Flanders Field Poppy artwork to commemorate ANZAC Day 2016. Well done Jaydn! Ainslie School is hosting a preschool information session for prospective parents on Wednesday 6 April at 5.15pm. If you are thinking about enrolling your child into one of Ainslie School's preschool settings (Ainslie, Baker Gardens or Reid, Dirrawan Gardens) for the 2017 school year, then please come along to the information session to meet the teachers, team leader, principal and have your questions answered about these quality early childhood settings and the programs. Building Partnerships = Building Social Capital! This week at Ainslie School's Baker Garden Preschool, Dan and his Gran shared one of their favourite picture books with the other children who attend the preschool. At Ainslie School we believe in the importance of empowering families, being welcoming, demonstrating deep respect and a belief that families have their child’s best interests at heart. Partnerships involve establishing a sense of community, where both children and families know that they belong and make a valuable contribution. The spirit of Ainslie School was evidenced in our four Houses today. The children fostered camaraderie and friendly competition and we are so proud that the three key messages from our 'Back to School Bash' assembly at the beginning of the school year - everbody being a leader, showing kindness and demonstrating friendliness - were observed in abundance throughout the bleachers! Ainslie School named its four Houses in honour of people who contributed so much to the early development of the School and its activities. Pictured here are members of Rupert-Smith House. Mr Smith was the Principal of the School between 1929 and 1935. The House events are a great way for students to develop friendships across different year levels and extend their groupwork skills. All our House events contribute enormously to the maintenance of our Ainslie School spirit. As accomplished musicians and members of the Ainslie School Year 5 Band, (L-R) Samira, Matthew, Ella, Adele, Hannah and Matilda, all auditioned for the Year 6 Instrumental Music Program's Primary Concert Band during Term 4 of 2015 and have been invited to join this representative band during 2016! Well done to our developing maestros! What an achievement! Ella hits the big time! Ella from Year 5 at Ainslie School, has been notified this week that she is a finalist (of over 800 entries across Australia) in the 'Young Writers Picture Book Awards'. We are very proud of Ella's achievement! Pack a picnic dinner and join the rest of the Ainslie School community for a social evening to celebrate the new school year. Teachers will present information about classroom learning programs and routines on Wednesday evening 10 February 2016. Welcome to the 2016 school year ! Ainslie School has welcomed staff, families and students to the 2016 school year with a 'Back to School Bash', morning tea with 'tea and tissues', a surprise appearance by the rock band 'No Direction', a 'happy dancing' principal, the 2016 signature song 'Dynamite' sung to welcome the Kindergarten children and teachers focussed on building quality relationships within and across our organised learning communities. Year 4 also found time to harvest tomatoes, capsicum and basil from the school gardens on Friday to make some fresh bruschetta. Pictured here is John savouring some of the 'fresh tastes'! After a busy year, today is the first day of school holidays. If you would like to keep in touch over the summer, please 'like' Ainslie School's Face Book page. Stationery Packs will be delivered to classrooms in the first week of school. If you haven’t already paid for your child’s pack cash payments can be made to the front office in the last week of January (Office staff will be in the office from 27 January), or the first week of February. Payments can also be made over the holiday period to the Ainslie School Account BSB : 032 777 Account number: 000962. Please email kate.chapman@ed.act.edu.au , catherine.dillon@ed.act.edu.au and jo.maybury@ed.act.edu.au . We will make contact with you by COB the 27 January, 2016. Keith Robertson our 'Chess Master' retires...Again! Keith Robertson, joined the Ainslie School community as a leader and tutor in Chess after he retired at the age of 65. This week, Keith retired for the second time! We are very grateful to Keith for the tutorage he has provided hundreds of children over the past 22 years... teaching skills in visual and mental precision, repetition, ritual, calculation and planning, celebration, struggle, foresight and maintaining a 'poker face'. Keith's contribution to our school is very humbling and the children have certainly received many trophies, ribbons and medals over the last 22 years. Pictured here with Keith left to right are Ben (year 4), Kate Chapman, Thea (year 4) and Hannah (year 4). Keith will be forever valued as the Avant Garde of Chess tutorage at Ainslie School! A day at the Governor-General's home! Catherine Manners, and all the children in her class, attended the Governor-General's Sports Fun Day in Yarralumla last week. Sir Peter Cosgrove spent time with the children from Ainslie School. Oh happy days! Ainslie's P&C Association says thank you! Apart from planning and delivering a variety of successful community activities throughout the year, Ainslie School's P&C Association today thanked the teachers for the work they do...a beautiful morning tea and delicately wrapped gifts! We are so proud of our year 3 to 6 kids who performed at the Inner North Spectacular with contemporary dance, instrumental accompaniment, solo voice and group choral work. Their body of work presented was titled '25 trips Around The Sun' and celebrated music education being taught at Ainslie School for the last 25 years - with a special mention of their music teacher Julie. The children sang and danced to some old favourites from the Carpenters, New Seekers and Les Miserables as well as a contemporary number. Thank you to the teachers who prepared the kids - Julie Mayhew, Catherine Dillon, Mel Rawlings, Karina Adams, Jo Francis and Mel Cummins. Thank you also to Holly Diggle, choreographer and dancer from 'Dance Northside', who taught 37 children many contemporary dance phrases effortlessly! Ainslie School's annual fete will be hosted next Saturday the 7 November from 10am to 2pm in the leafy school playgrounds - mark your diaries now as there is so much to do - hot food, cakes and sweet goods, trash and treasure, plants, high quality pre-loved books, clothing, carnival rides, cooking demonstrations, live music and displays. 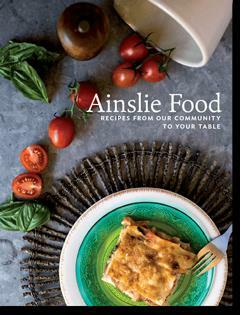 Don’t forget to pick up your own copy (as well as copies for gifts at Christmas) of the 'Ainslie Food' cook book. Thank you to Ainslie School's energetic and community focused P&C Association...their events are always an 'esprit de corps' showcase! On Friday 30 October, the school community celebrated the official opening of the school elevator. Rebecca and Harley Buckman were guests of honour along with the Cummins family and former Ainslie School Principal Prue Clarke. The elevator has been named after former student William Cummins who passed away in 2001. Kate Chapman acknowledged the consultancy work and project support that Rebecca Buckman has provided to the school over the last 18 months to drive the project to completion. The elevator can be accessed from the playground exterior to the building, and moves to the ground floor and first floor internally. Proceeds will go to developing Ainslie School’s outdoor grounds as great gathering and learning spaces and to enhance the learning environment in our classrooms. Thank you for your support. Happy cooking! Ainslie Food celebrates the rich and diverse community that supports Ainslie School - its children, parents and carers, teachers and staff. It is a major fund raising project led by Ainslie School’s Parents and Citizens Association. The proceeds from Ainslie Food will enable us to develop our outdoor grounds as great gathering and learning spaces. We will also direct the proceeds to further enhancing the learning environment that our passionate and skilful teachers can provide in our classrooms. Over two years Ainslie Food has been lovingly put together by a passionate and talented group of Ainslie parents. They came together to brainstorm, organise, gather, cook, photograph and edit over 125 recipes. This group shared their food stories and laughed a lot! Recipes were submitted by parents, teachers, students, members of our broader community and local businesses including Ainslie IGA, Shop Girl Flower Girl, Italian and Sons, Thirst Winebar and Eatery and Sage Dining Rooms. The style of the food is wonderfully diverse and includes a combination of simple and more challenging recipes that can be prepared at home. Nathan fell in love with Ainslie School’s beautiful art deco school building, appreciated Ainslie School’s strong commitment to preparing and eating good food and saw all the right ingredients to create stunning photographs! Archie hits the big time! Archie from Year 6, recently participated in the Australian National Junior Table Tennis Championships held in Adelaide during the school holidays. Archie was part of the ACT team that participated in the Under 18, Under 15 and Under 13 divisions. He represented in the Under 13's, for singles, doubles and team events. Archie won his first doubles match but then lost to the eventual Under 13 doubles winners from Victoria. Archie's next big match will happen when he plays at the Pacific Schools Games to be held in Adelaide in November 2015. Archie is also a keen chorister with the Ainslie Voices and is currently preparing for a performance at the Inner North Spectacular. We are very proud of you Archie! Historical Sakura trees in bloom! In 1966, Ainslie School led the way as the first primary school in the ACT to offer Japanese classes. In March 1967, the Honourable Doug Anthony, then Minister of the Interior, planted a Gingko tree in the school grounds. Later, 24 cherry trees were planted adjacent to the basketball court. Mr Barry Jarman and Kaigyo Miyazaki, the Abbot of the ancient Buddist Byakugo-ji Temple, both of the Japan-Australia Society, suggested a sister school relationship between Tsubai, the oldest elementary (primary) school in Nara (1872), and Ainslie, the oldest primary school in Canberra (1927). Nara had been a capital city, Canberra is a capital city and both schools have famous, former students, including the Mayor of Nara. Over the last three weeks, we have been preparing a multimedia presentation about Ainslie School as a gift for Tsubai Elementary School in Nara. This gift will be presented to the school personally in the next couple of weeks. 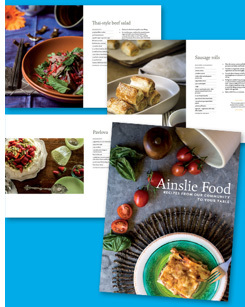 'Ainslie Food' - our glossy cook book is to be launched! Recipes from our community to your table. 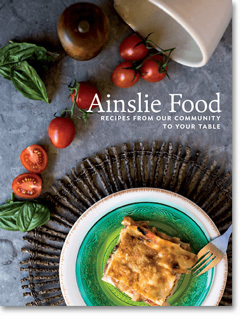 Join us on 22 October at 6pm as Minister Joy Burch launches the Ainslie School Cookbook, celebrating our delicious and diverse community. Sage Restaurant’s Mint Bar, Gorman House Arts Centre. Account Name: Ainslie Primary School P&C Association Inc.
For a limited time our Ainslie Food Cookbook is available for only $30. 'Down The Garden Path' ! MEET the author of "Chooks in the City"
This is a 'Rain, Hail or Shine' event! Fundraising - artwork masterpieces created by our children! Students have been busy creating a masterpiece which families can buy printed on calendars, cards, notebooks, diaries, pillow slips & iPhone* covers with each child's artwork printed on it. These products make great keepsakes and gifts for Christmas and Birthdays. Also available to buy are mixed celebration packs of 8 cards designed by Ainslie students which are great for Christmas and birthdays. To order go to http://goo.gl/KTxGix and follow the instructions. Payment can be made by bank transfer, cheque or cash. Orders due by Friday 18 September. Notes were sent home with students last week with details and copies of the artwork. On the first day of spring, Kindergarten and Year 1 classes attended an excursion to the National Arboretum as part of their inquiry into Fairy Tales...great fun was had by all on the climbing equipment! Ainslie School's P&C Association, have announced some of the activities for this year's 'Down The Garden Path' event - an annual walking tour of private gardens around the Ainslie locality and 'pop up community activities'. Mark your calendar for Sunday 20 September... and bring your family and friends to Corroboree Park (Paterson Street) commencing at 11am. A great community day out! Year 4 students and their teachers (Greg, Angela and Yuta) have just returned from school camp at Birrigai. Pictured here (L-R) are Teegen, Holly and Ella in the dining hall ... Oh happy days! Last Friday, students from Kindergarten to Year 6 enjoyed a range of activities in multi-age groups to acknowledge NAIDOC Week. Xavier from Year 1 chose an art activity. Local sculptor, Geoff Farquhar-Still, recently spent a day at Ainslie Baker Gardens Preschool working with the children on a project for the Campbell Section 5 Development on ANZAC Parade. Local printmaker, Antonia Aitken has also spent time with the children at Reid Preschool. Pictured here is William from Ainslie Baker Gardens Preschool...imagining what could be created with his mentor Geoff! Molly Polly is the name given to a very cute Silky Terrier puppy that will start at Ainslie School on Monday as a registered Service Dog. Molly is quite smart, playful and an incredibly happy-go-lucky little dog that loves children, her family and her trainers. Molly will attend Ainslie School every day with Hannah and Olivia in Year 2. You may see her walking to school, in Japanese, library or music lessons, on the playground, walking in the corridors or learning beside the children in class. Welcome to our school Molly! Hannah and Olivia are 7 year old identical twins who attend Ainslie School and live with Type 1 Diabetes (T1D) and anxiety. Unfortunately, because Hannah was diagnosed with diabetes when she was two, she is often hypo (low) unaware. This is quite dangerous, especially at night. Olivia developed severe anxiety, due to her twin's diagnosis. Within 4 ½ years both girls had developed T1D and anxiety. After consultation with the Guide Dogs - Pets as Therapy Officer, Adrienne (Olivia and Hannah's mum), purchased a puppy to be trained to help both girls with their anxiety and hypos. An Australian Silky Terrier was chosen due to the breed being so loyal, hardy and they don't moult. 'Dogs on The Run' (an ACT service) helped train Molly in obedience to meet the criteria to be an Assistance Dog. Molly's diabetes training comes from 'Diabetic Alert Dog University' in the USA. Molly is registered as a Trainee Service Dog through 'MindDogs'. This organisation certifies Assistance Dogs for those people with mental health illnesses. Molly is half way through her diabetes training. At present she picks up 50+% of hypos and all high ketone events. She has alerted her family at 4am to Hannah requiring an ambulance. We welcome Molly to Ainslie School. Zoe from year 2 was working in the garden at lunchtime today planting some ground covers - look at that smile! The school's canteen, Kidzbar, will be closed from tomorrow for refurbishment. It is anticipated that the space will be ready for occupation again from the beginning of term 2...we'll keep you posted on Facebook. On Wednesday 8 April, Ainslie School is holding a Preschool Information Evening for families who are interested in 2016 enrolment at either Reid Preschool or Baker Gardens Preschool settings. Ainslie School Principal Kate Chapman, Deputy Principal Catherine Dillon and the current preschool teachers will present information for families about the programs. Prospective families are invited to attend the session from 6pm to 7pm in the school's library within the primary campus at Donaldson Street Braddon. Ella from Year 5 and hardworking Eliza from AOKs were both in the school's garden this evening estimating the height of an enormous tomato plant. There is always excitement in the air on the day our school photos are scheduled. This year, we posed on the school's front steps to have the photos taken, with our magnificent Art Deco school building in the background. The children gathered in the hall at lunchtime for family photos. Pictured here is Jude (year 6) with his sister Jaime (year 2) calmly eating their lunch waiting for the photographers to call their names! Local artist, Dimity Kidston, meets with interested students during Friday lunchtimes to work together on a weaving project using a variety of fabrics and hula hoops. Pictured here, is Dimity with her daughter Rose. Odessa contributes to the World's Greatest Shave! Odessa from year 6 had her hair cut yesterday at the school's assembly, as part of the Leukaemia Foundation's 'World's Greatest Shave'. Odessa's ponytail has been donated to a company that makes wigs for people who have been affected by cancer treatments. Laurence Mandapat (Odessa's teacher), carefully made the necessary snips. We are very proud of Odessa's courage and the kindness she has shown to other people. The Annual General Meeting of the Ainslie School P&C Association will be held at 7.30pm on Wednesday 25 March in the school's staffroom. Information regarding the positions and agenda can be downloaded from the 'school notes' section of this website. Everyone in the school community is welcome to attend. A lovely photo moment was captured at school today...a proud Norman from Year 2, entered the school's foyer with his writing book in hand to see Mrs Chapman our Principal leaving the school by bicycle to meet the preschool teachers. The sound of "Mrs Chapman, wait" was heard which persuaded Kate to stop exiting the building and turn quickly in the doorway. Norman ran to her as proud as punch of his writing! Now...these magic moments are what every Friday should be all about! We are also very proud of you Norman! Today's perfect weather provided the foundation for a highly successful swimming carnival. Thank you to our Year 6 teacher Laurence Mandapat for organising the day...pictured here are Tom and Ethan preparing to participate in some Sporting House war cries! Reid Preschool's Welcome Tea 2015! Did you enjoy last Thursday's balmy evening? Well Reid Preschool's families did by attending a welcome tea. Pictured here is Stacey Richter (one of our dedicated early childhood teachers), with Claire Henderson and her two sons, Asher and Luca. 11 members of Ainslie School’s 2014 Year 5 Band have been invited to join the ACT Primary Concert Band program which is directed and administered by music teachers from the Directorate’s Instrumental Music Program. Membership of this band is similar to membership of an ACT representative sporting team. Congratulations to Emma M., Emma S., Eliza, Elizabeth, Rebecca, Natalia, Liliko, Amy, Naomi, Daisy and Isobel F.
You can't stop the music ! Thank you to Ainslie School's P&C Association who hosted the annual family picnic last night to welcome 2015...as has become usual practice, Nova and Libby also organised perfect weather conditions! · 2 x parent and citizen member positions. You can pick up a nomination form from the Ainslie School front office during normal business hours (9am to 3pm, Monday to Friday), or request one be emailed or faxed to you. Nominations must be submitted to the Assistant Returning Officer (ARO) between 2-16 February 2015 –noting that nominations close at 11am on 16 February 2015. The nomination form and instructions can be downloaded from this website and is located within the 'notes home' section. Everynight at 7.30pm, our caring and kind kindergarten teachers hit the sack so they can start physically preparing for the next day #bestjobintheworld! Jenni Hall, Jayde Condon and Sascha Colley (L-R) were up bright and early this morning preparing for their first day of Kindergarten at Ainslie School...Oh happy days! We look forward to all students returning to school tomorrow. Thank you to Jet's Grandfather, Ron, for watering the school's rockery garden whenever he had a few spare minutes during the past year. We certainly have a blooming marvellous display of colour for the start of the school year! Eliza and our After School Care team have also been watering the gardens and caring for the chickens during January.